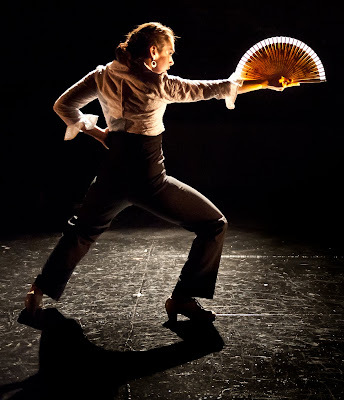 A new year and an altered program, but not quite a sequel, Rebeca Tomás and company premiered a revised version of their debut Spring 2010 flamenco performance January 28-31, 2011 at Manhattan’s Theatre 80 in the East Village. 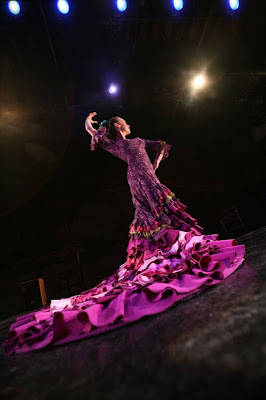 Re-titled, A Palo Seco: Rasgos Flamencos, this show was Tomás’ ode to tradition and invention. Tomás and company’s performances continued the legacy of flamenco with the kind of sincerity and passion any Andalusian aficionado could be proud of. Sitting in the audience at Sunday’s matinee performance, I was nervous for Tomás when Theatre 80’s manager Thomas Otway announced A Palo Seco: Rasgos Flamencos would join the ranks of historical performances the theater has hosted, such as the original production of You’re A Good Man Charlie Brown. Despite Mr. Otway’s grandiose comparisons, the company wasn’t jinxed, and delivered a memorable program strong enough to dismiss most of the criticism (The Times, The New Yorker) of the 2010 version. After an energetic opening that introduced the audience to the company’s musicians and dancers by way of a customary bulerías (a festive improvisation), Tomás emerged from the wings with fierce authority. Pensive and compelling, she used a Spanish fan as a percussion instrument during her a palo seco (acapella with percussion) solo, Abanico: Rasgo Flamenco. Her strongest contemporary choreographic effort on the program, the dance’s repetitive blackouts revealed Tomás striking varied poses, looking a little like a deer caught in the headlights. Her nerves simmered down as soon as she moved out of her isolating pool of light, and took to the stage like a bullfighter in a ring. High-waisted black pants and a blousy, crisp white shirt made her petite frame appear statuesque and powerful. She echoed the sound of the cajón and the three accompanying singers with meticulous rhythmic footwork, and a body percussion score. Tomás’ dancing in Abanico ignited a palpable tension that remained in the air for the rest of the show. In Alegrías, Tomás traded in her fan for a bata de cola (a dress with a long ruffled train). A traditional flamenco dance accessory, Tomás playfully whipped her skirt to the jaleos (shouts of encouragement) from the audience. At times, the bata de cola appeared distracting and seemed to burden her traveling footwork patterns, yet she seemed much more at ease in the limelight than she was in Abanico. The audience was absolutely enamored with Tomás’ performance. Though I preferred Abanico, their enthusiasm was contagious, and the piece seemed a fitting end to the highly expressive evening. A mention must be given to the incredibly dynamic dancing of Sol “La Argentinita” in the somber solo, Soleá. She swallowed the space, carving her torso and arms elegantly and with raw audacity. Her piercing eyes never allowed me to escape her gritty performance. Percussionist and singer Oscar Valero’s cajon playing was equally as ferocious, and echoed by David Castellano’s soulful voice. Flamenco dancing owes so much to its musical counterpoint, and the company’s five musicians were extremely attentive to the dancers, and very supportive of each other throughout the performance. Achieving the program’s goal of juxtaposing raw emotional darkness and festive playfulness, the show’s concept did not attain Tomás’ desire for ingenuity. Nevertheless, she and her company continue to seriously contribute to flamenco in New York. Photos for this article are courtesy of Lee Wexler and Maly Blomberg, respectively.